In Germany it is allowed to modify the image of the eagle from the official Coat of Arms. Various institutions use therefore various designs of the eagle. The eagle shown on German obverses of euro coins is the most similar to the one designed for the German parliament (Bundestag) by Ludwig Gies in 1953. 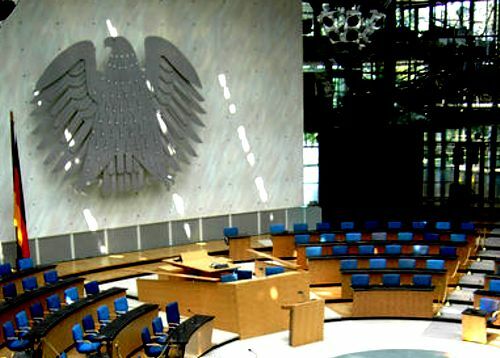 Geis' eagle was placed in the parliament in the contemporary German capital Bonn and today hangs in the parliament in Berlin.